Indonesia has one of the fastest growing economies in Southeast Asia, with positive outlooks for the next few decades to come. It is the 16th largest economy in the world by nominal GDP and is the 7th largest in terms of GDP. Powering the country’s economy is the agricultural sector, which accounts for a large majority of Indonesian exports and imports. It is not an exaggeration to say that the progress of Indonesia is largely fueled by its people. But despite being one of the core sectors of the country’s economy, the Central Bureau of Statistics reports about 25.5 million farmer households are still living below the poverty threshold. These households generally have no access to formal financial services such as savings, electronic payments, loans and insurance. Thus, they are also ill-equipped to withstand financial emergencies such as poor harvest, natural disasters, medical bills and others. This is despite having agricultural subsidies for about 60 per cent of agricultural spending in Indonesia. Breaking free from this poverty cycle will require a total rethink of the inclusive banking approach, and looking for better ways made available through innovations in financial technologies. 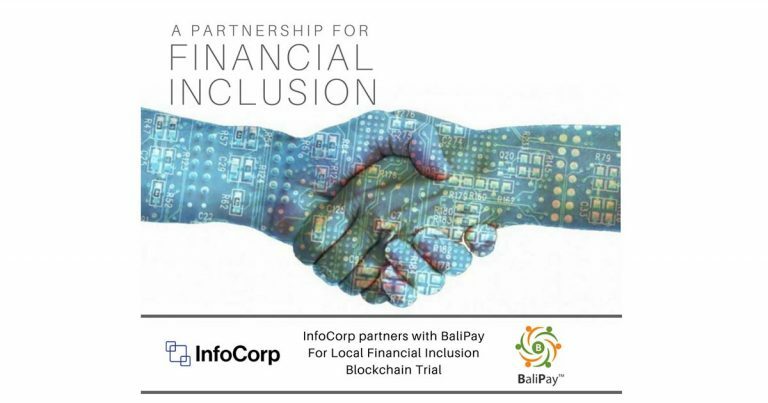 As a reflection of InfoCorp’s whitepaper, which subscribes to the potentials and the use of local currency systems in solving financial inclusion problems, one of our partners Balipay has successfully demonstrated the use of this concept. Phase 1 of our design map will be the issuance of a community currency called “Balipay Points” using SMS. The plan for the next phase involves the use of InfoCorp’s CrossPay. CrossPay is a blockchain-based mobile delivery tool for inclusive banking services. Unlike other blockchain wallets, CrossPay is designed to work with the private blockchain platform that is more suitable for real world business use. It goes beyond mere payments by facilitating electronic cash-on-delivery, microfinancing, and P2P insurance. More importantly, CrossPay is also designed for livestock tokenization, which is an innovative and revolutionary concept in applying blockchain to solving financial inclusion problems. In partnership with InfoCorp and endorsed by IFC World Bank Group, Balipay was launched as a pilot cashless payment system for the unbanked. The project targets farming communities in Bali. The founder of Balipay, Dr John Vong, has worked as senior adviser to the World Bank Group, United Nations, and Asian Development Bank and in other areas and frontiers of development in the ASEAN and South Asia. He has consulted for 2 central banks, 5 global banks, 5 technology giants, and 8 governments. Dr Vong also started Singapore’s Financial IT Academy at SMU. According to John, “Balipay has demonstrated a successful business case by reducing the need for an intermediary in the marketplace enabling farmers to increase their income generating capacity, leading to improved livelihoods. The Balipay Pilot uses simple SMS technologies in the current phase, and through our strategic partnership with InfoCorp in the next phase, our business model can be rapidly replicated by their blockchain technology across the villages”.